Developing a highly technical garment like a cycling bib is a complicated process that can take over a year from conception to roll-out. Last spring, Podiumwear product designer, Kristine Larsen decided to take on the challenge of this process across all three of our cycling lines – Gold, Silver and Bronze. “We try to balance product consistency with industry trends and innovation,” says Kristine. “We decided the time was right to jump on some of the new fabric technologies out there and utilize the feedback we’ve been gathering from our riders.” The outcome of this effort has been the most technical and comfortable cycling gear Podiumwear has ever produced. “The main goal for our Bronze line was to improve the shorts and bibs while making sure they were still affordable,” says Kristine. Like previous versions, the new bronze line is semi-custom, which means the inner leg panels are a highly durable black nylon fabric while the outer leg and back panels are fully customizable with your own design. The bronze bibs and shorts still feature overlock stitching for comfortable and clean seams and a 2-ply back panel for modesty. The biggest change is the update to the customizable outer leg portion of the bib - a lightweight, more supportive fabric now gives the shorts improved body and shape retention while boosting the overall comfort level. We also ditched the fold-over leg band for a more technical gripper at the leg opening, which helps keep the bibs and shorts in place while riding. Lastly, though you won’t notice it until you’re in the saddle, we’ve upgraded to the Bastogne Chamois by Elastic Interface, which is designed for long distances in the bike position, up to 6 hours. Podiumwear’s Bronze line is designed for riders who want comfort and reliable performance along with a really accessible price point. 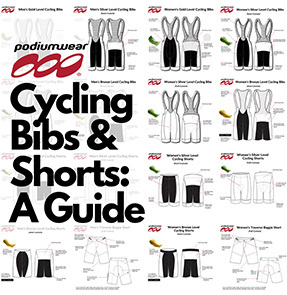 The changes to the bibs and shorts go a long way to improving performance while keeping cost as low as possible. "The new Silver line bibs and shorts are a by-product of serious rider feedback and exciting industry trends,” notes Kristine, while gazing fondly at her bin of prototypes. The first change you’ll notice is a wider grip band. In response to issues with wear and tear, the Silver bibs now have improved Powergrip leg bands. The technical construction of the fabric provides light compression but firm grip over a wider surface area (an inch wider at 3”), while the finished edge ensures it will stand up to tough rides and tough washing machines. You’ll also feel the difference in the fabric. The new fabric is more lightweight and breathable, but also even better at holding color, which means you’ll notice less change in your design when it’s stretched out over legs and backs. The new shape of the bibs’ mesh upper lessons chances of it peeking out from under your jersey. The new mesh fabric also has a more open weave for a softer feel with plenty of stretch. Lastly, we’ve updated to the Men’s and Women’s Endurance Chamois by Elastic Interface, designed for up to 7+ hours of riding - your undercarriage will thank us. Kristine has done an amazing job of blending technical details to a super comfortable and reliable design. The silver level also offers both a full-custom bib and short as well as a semi-custom version. “Our new Gold is a totally different beast,” states Kristine. “It’s probably the biggest departure from our past line, only because we used so many exciting and innovative technologies in its construction." Probably most exciting is the Cold Black technology fabric used on the inner leg fabric which reduces heat build-up. The fabric is primarily Nylon with a Polyester yarn lining the inside. “It’s like having air-conditioning, says Kristine.” We’ve also upgraded the fabric on the customizable outer leg panel. This new material features a raised honeycomb pattern that feels soft against the skin, while effectively wicking moisture from inside to the outer surface, where it evaporates. It also holds sublimation ink colors extremely well. Overall, these bibs have a more compressive and supportive feel than the old version. The new 3” wide Powergrip leg bands are also featured on this bib. The combination of enhanced fabrics, new leg bands and improved open mesh upper means that you’ll feel a distinct difference when you put it on. It won’t be until several hours in the saddle, however, that you’ll be able to appreciate the new men’s and women’s Endurance Anatomic Chamois from Elastic Interface. The chamois features three foam densities to deliver superior support in the key pressure zones for long distance rides up to 7 hours in the saddle. It also features a new sewing technique called the “Risen Effect” that allows the foam inserts to rise or stand out for more distinct padding zones. Finally, this chamois has a 3D anatomic shape that hugs your body, reducing friction zones even more. If you’re looking for the ultimate cycling bib, look no further. We’ve seriously got you covered. Finally, a Full-Custom Mountain Bike Baggie! “Designing the full-custom Traverse Baggies was an intricate process. It took a while but we are so happy with how they turned out,” says Kristine. Podiumwear has been the national sponsor of the National Interscholastic Cycling Association (NICA) since 2015. We designed the Traverse Baggies specifically for NICA’s thousands of high school mountain bikers and their coaches and parent volunteers who wanted a full-custom design option in a baggie short. The first hurdle was finding the perfect fabric – one durable enough to hold up to run-ins with rocks, twigs, trees and dirt while also having the right amount of stretch, breathability and the ability to absorb our sublimation ink well so the custom designs really pop. “We ended up finding a mill that was willing to work with our specific needs to create a fabric just for Podiumwear,” said Kristine. “Once we had that fabric, we made lots of prototypes to get the right fit and features, we got them on a bunch of different bodies and sent them out on the trail in all kinds of conditions for testing.” The end result of all this work, is a baggie with full-design capacity (every inch can be sublimated with your design, including the inner waistband). An adjustable clasp waistband system allows you to get the right fit every time. The tapered extra-long (11.5”) inseam hit at the right spot and give the shorts a flattering look. There are three strategically placed pockets for all kinds of storage. These shorts do not have a chamois and are designed to be worn over your favorite cycling liner or short. If you are looking for a state-of-the-art full custom baggie, we are proud to say: this is it.